If life is one ongoing adventure and each day is its own side quest, then several days ago the already labyrinthine halls beneath Madison Square Garden were not those of a theater but a dungeon, and the spirited host of attendees was nothing short of raiders in pursuit of plunder. Their coveted treasure on this magical evening of Nov. 28 was The Legend of Zelda: Symphony of the Goddesses from Jason Michael Paul Productions. Wielding the baton like her own personal Master Sword (or, as was the case at the onset of the Wind Waker movement, an actual replica of the Wind Waker), conductor Eimear Noone led the Orchestra of St. Luke’s into an epic musical campaign that toured across Hyrule and the 16 games in Zelda’s renowned platform, which is currently celebrating 25 years since its American debut on the original 8-bit Nintendo Entertainment System. The evening commenced with a rousing overture in the form of “The Legend of Zelda Medley” before embarking a four-part movement that began with the crowd favorite Ocarina of Time, and concluded with A Link to the Past, the game where many of the now iconic Zelda themes first premiered. 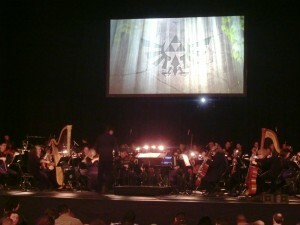 Each movement in this symphonic journey—this Tour de Triforce, if you will—began at the beginning of each game and proceeded to tell the familiar tales of heroism and mystic wonder, transitioning almost fairylike from one key moment to the next, as large screens over the orchestra showed in-game footage for context and intermittently focused on soloists and the choir. The visuals repeatedly drew boisterous approval from an audience that was all too willing to voice their appreciation, which included tunic-wearing fans with swords and shields, some dressed in gala finery, and a few who were, appropriately enough, an interesting mash-up of the two. If ever there was a video game that welcomed, and indeed, demanded audience participation, Zelda presents a strong case. Creative lead and show emcee Jeron Moore revealed in a recent YouTube interview that Zelda is one of those franchises where the main character, Link, has no voice, which lends more ownership of his heroics to the player who is, in essence, linked into the game world through the character he or she is directing. Not only that, the absence of spoken dialogue in the game makes the role of music in Zelda games all the more important. It must be said that this concert transcends a mere performance of video game music, even music as highbrow and technically intricate as Zelda is. Each movement was arranged and fitted together in such a way that the music itself became a wordless narrative for a story, the flow of which was not unlike playing a Zelda game: now adventuresome and whimsical, now dark and dire, now uplifting and celebratory. The Zelda scores, which are an irreplaceable cornerstone and testament to composer Koji Kondo’s musical genius, evoke deep feelings of nostalgia and personal memories from anyone who has played the games. I, for one, remember staying at a friend’s house and gaming until dawn trying to finally beat A Link to the Past. Sitting in my seat, I was suddenly in third grade again and had just sunk that last arrow into Ganon’s big stupid head, and all was right with the world. Looking around at various points in the show, it was apparent that other people were reliving similar moments. Such is the profound effect that great music, great games, and great stories have on us, and their worth should never be undervalued. Although not all the greatest hits from every game could be included in this modest two-hour performance replete with not two but three encores, the audience’s thirst was slaked, and their expectations for the show seemed to be outright exceeded. This was a concert in which its quality was greater than the sum of its parts. 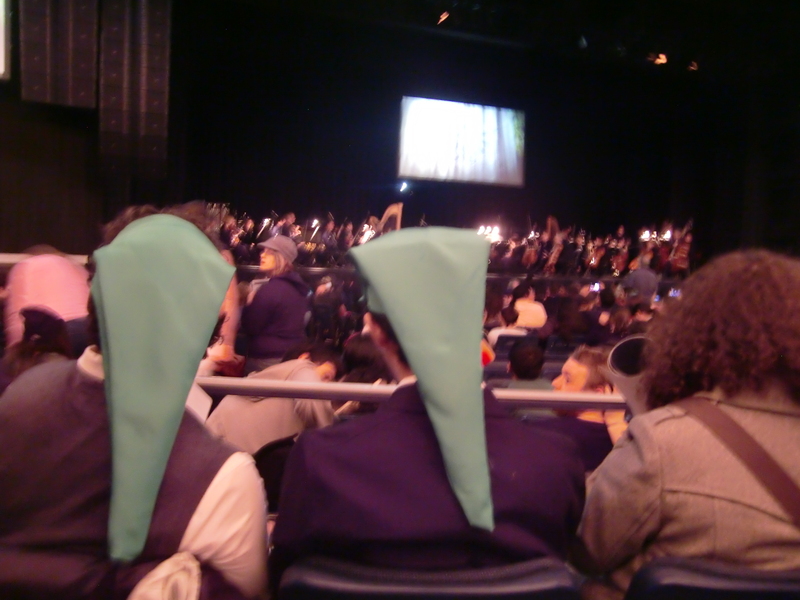 Yes, the musicians performed masterfully, each handling their respective instruments with the same deft skill as Link using his boomerang and grappling hook, and yes, the game footage was engaging and synched with the music to elevate the audience’s enjoyment, but there was also so much attention paid to the nuance, so much consideration given to the fans, that the show became a kind of homage to both the franchise’s legacy and to every avid gamer whose collective fealty raised Zelda into one of the highest echelons of video game lore. Symphony of the Goddesses has been touring across North America for the past year, and has succeeded brilliantly in fusing gaming culture with high art. The good news is you need not know the first thing about the games or symphonic music to enjoy yourself. The show is amazing in its own right, and your attendance at their upcoming performances is highly recommended. Come prepared to enjoy yourself and let Mr. Moore and Ms. Noone provide all the background information you might need. As someone whose father used to refer to my SNES as the “idiot machine,” it is very heartwarming and vindictively satisfying to see video games increasingly receive due credit for their artistic, educational, and innovative merits. Zelda, for all its puzzles, unique boss fights, and other challenges, is one of our perennial favorites. For JQ editor Justin Tedaldi’s July 2012 interview with executive producer Jason Michael Paul on the tour, click here.